Fire Resistance will now remove the red fog when in lava as well as fire overlays in first person. In 1.10 vanilla Lava and Water no longer uses the fluid interface which meant that flowing water and lava would once again incorrectly spawn mobs, this has been fixed with a manual check for the vanilla fluids. Fixed a bug where picking up or fearing players would easily break, especially if the player had died and respawned or changed dimension. Fixed a bug where mount area abilities such as the Shade's horrific howl that fears nearby entities was not targeting any mobs at all. Lava/Ooze mobs that can walk on land such as Lobbers should be faster in lava/ooze now as they could barely move before. Eruption mob event now spawns Salamanders! Black Plague mob event now spawns Phantoms and Geists (Ghouls and Crypt Zombies are removed from this event in place of Phantoms). Shadow Games now spawns Grues and Darklings (no longer Phantoms). 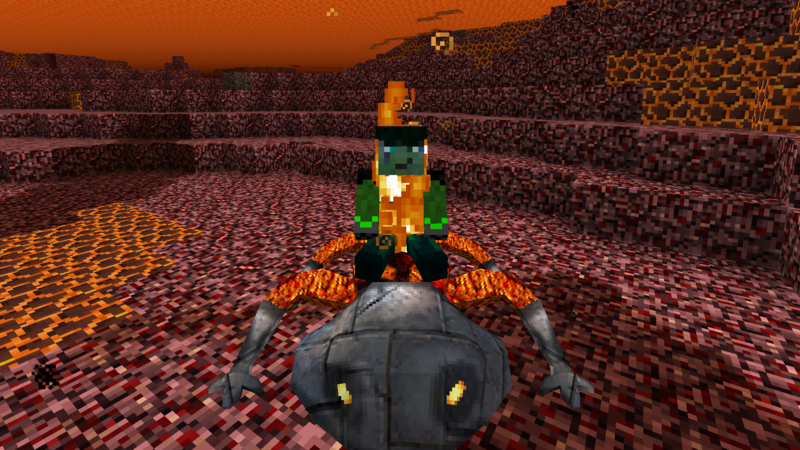 Bosses should no longer be able to ride in Boats or Minecarts, etc. Fixed a bug with mounts where the jumping strength would be too high in certain circumstances. Striders can no longer be pushed by water currents. ============================================================ Lycanites Mobs Update: Saucy Salamander - Version 1.15.1.0 for Minecraft 1.10.2 Configs older than 1.14.2.2 will be reset. ============================================================ -------------------- New Features: -------------------- New Inferno Mob Added: Salamander Fire Resistance will now remove the red fog when in lava as well as fire overlays in first person. -------------------- Major Fixes: -------------------- In 1.10 vanilla Lava and Water no longer uses the fluid interface which meant that flowing water and lava would once again incorrectly spawn mobs, this has been fixed with a manual check for the vanilla fluids. Fixed a bug where picking up or fearing players would easily break, especially if the player had died and respawned or changed dimension. Fixed a bug where mount area abilities such as the Shade's horrific howl that fears nearby entities was not targeting any mobs at all. -------------------- Changes: -------------------- Lava/Ooze mobs that can walk on land such as Lobbers should be faster in lava/ooze now as they could barely move before. Eruption mob event now spawns Salamanders! Black Plague mob event now spawns Phantoms and Geists (Ghouls and Crypt Zombies are removed from this event in place of Phantoms). Shadow Games now spawns Grues and Darklings (no longer Phantoms). -------------------- Minor Fixes: -------------------- Bosses should no longer be able to ride in Boats or Minecarts, etc. Fixed a bug with mounts where the jumping strength would be too high in certain circumstances. Striders can no longer be pushed by water currents.